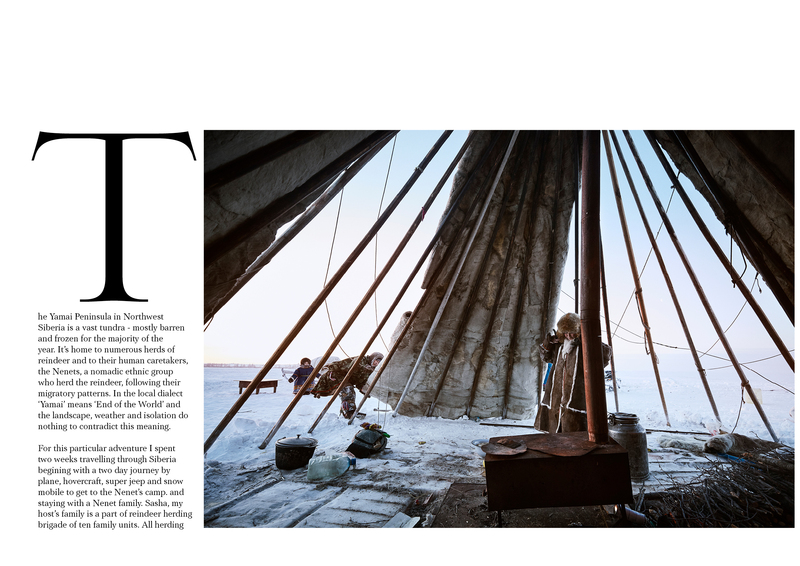 David Reiss is a photographer: known for taking gorgeous fashion shots of some of the world’s best models for high-end fashion bibles, he is also totally at home in remote and barren landscapes like the ones he captured here for Make Magazine in Siberia. 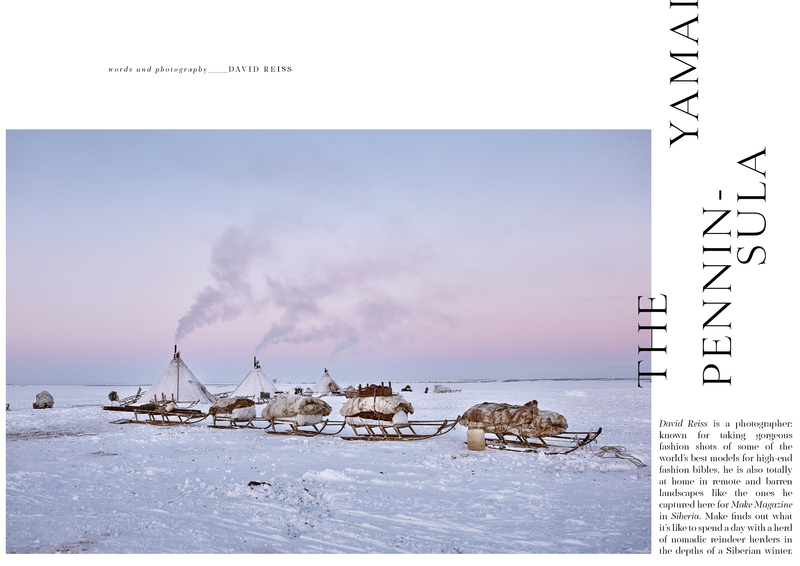 Make finds out what it’s like to spend a day with a herd of nomadic reindeer herders in the depths of a Siberian winter. The Yamai Peninsula in Northwest Siberia is a vast tundra – mostly barren and frozen for the majority of the year. It’s home to numerous herds of reindeer and to their human caretakers, the Nenets, a nomadic ethnic group who herd the reindeer, following their migratory patterns. In the local dialect ‘Yamai’ means ‘End of the World’ and the landscape, weather and isolation do nothing to contradict this meaning. 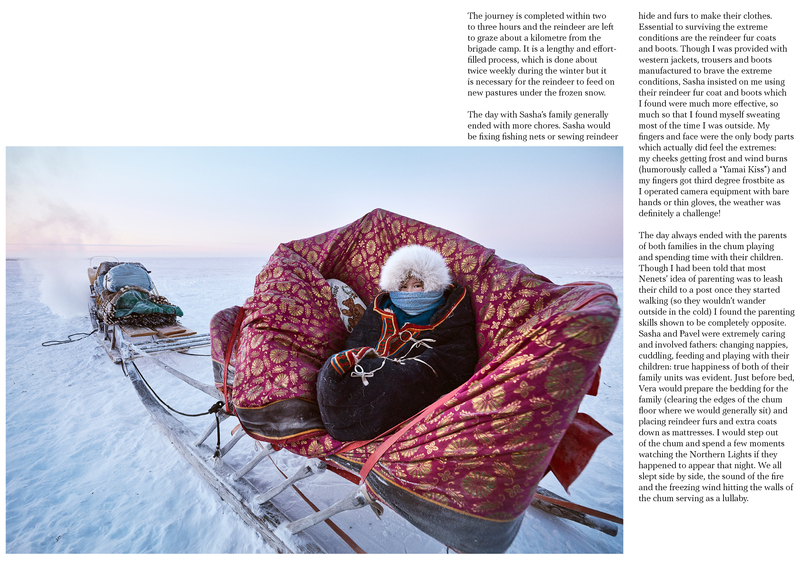 For this particular adventure, I spent two weeks travelling through Siberia beginning with a two-day journey by plane, hovercraft, super jeep and snowmobile to get to the Nenet’s camp. and staying with a Nenet family. Sasha, my host’s family is a part of reindeer herding brigade of ten family units. All herding Nenets live and work within a brigade of various member sizes from one to fifteen families and Sasha’s brigade has about five thousand head of reindeer. Family interconnects most brigades: many of the other men in Sasha’s brigade are his brothers and cousins. 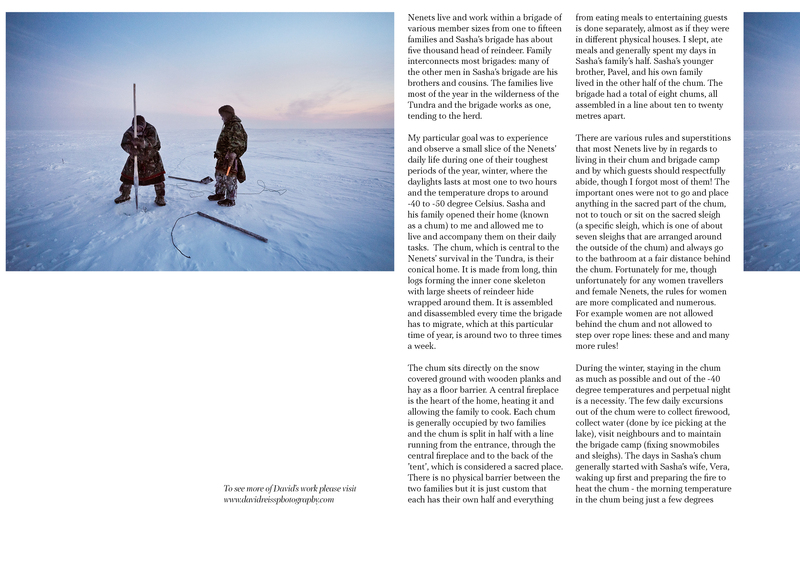 The families live most of the year in the wilderness of the Tundra and the brigade works as one, tending to the herd. 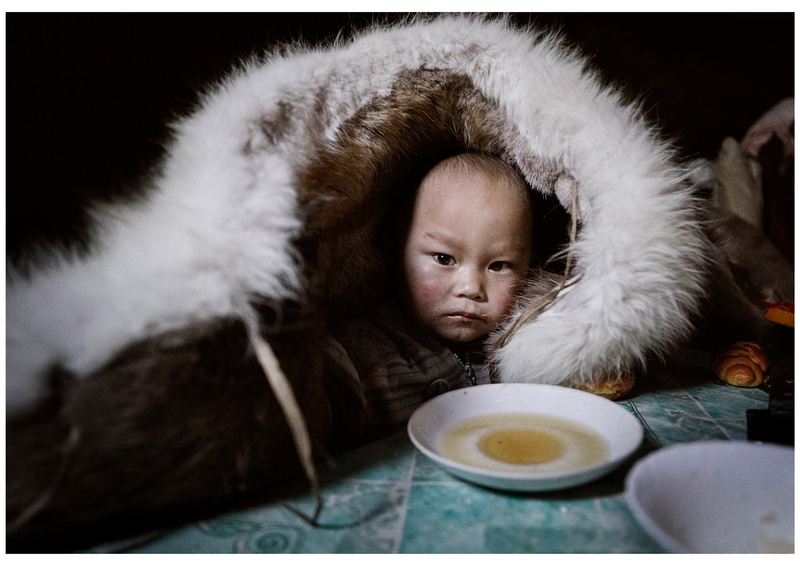 My particular goal was to experience and observe a small slice of the Nenets’ daily life during one of their toughest periods of the year, winter, where the daylights lasts at most one to two hours and the temperature drops to around -40 to -50 degree Celsius. Sasha and his family opened their home (known as a chum) to me and allowed me to live and accompany them on their daily tasks. The chum, which is central to the Nenets’ survival in the Tundra, is their conical home. It is made from long, thin logs forming the inner cone skeleton with large sheets of reindeer hide wrapped around them. It is assembled and disassembled every time the brigade has to migrate, which at this particular time of year, is around two to three times a week. The chum sits directly on the snow-covered ground with wooden planks and hay as a floor barrier. A central fireplace is the heart of the home, heating it and allowing the family to cook. Each chum is generally occupied by two families and the chum is split in half with a line running from the entrance, through the central fireplace and to the back of the ’tent’, which is considered a sacred place. There is no physical barrier between the two families but it is just custom that each has their own half and everything from eating meals to entertaining guests is done separately, almost as if they were in different physical houses. I slept, ate meals and generally spent my days in Sasha’s family’s half. Sasha’s younger brother, Pavel, and his own family lived in the other half of the chum. The brigade had a total of eight chums, all assembled in a line about ten to twenty metres apart. There are various rules and superstitions that most Nenets live by in regards to living in their chum and brigade camp and by which guests should respectfully abide, though I forgot most of them! The important ones were not to go and place anything in the sacred part of the chum, not to touch or sit on the sacred sleigh (a specific sleigh, which is one of about seven sleighs that are arranged around the outside of the chum) and always go to the bathroom at a fair distance behind the chum. Fortunately for me, though unfortunately for any women travellers and female Nenets, the rules for women are more complicated and numerous. For example, women are not allowed behind the chum and not allowed to step over rope lines: these and many more rules! During the winter, staying in the chum as much as possible and out of the -40 degree temperatures and perpetual night is a necessity. The few daily excursions out of the chum were to collect firewood, collect water (done by ice picking at the lake), visit neighbours and to maintain the brigade camp (fixing snowmobiles and sleighs). The days in Sasha’s chum generally started with Sasha’s wife, Vera, waking up first and preparing the fire to heat the chum – the morning temperature in the chum being just a few degrees warmer (from our collective body heat) than the freezing cold outside. After the rest of the family had woken, we had a breakfast of tea, bread, jam and crackers. The day continued with daily chores within the chum for the women while the men worked around the camp. Teatime shortly followed, tea and tea breaks being numerous during the day. The children generally stay within the chum all day, playing amongst themselves, drawing and filling in colouring books and watching pre-recorded TV shows from the family laptop when the portable generator was on. Lunch would usually consisted of fish caught from the Ob river and eaten raw and frozen, definitely an unusual concept, like chewing on a fish ice lolly but surprisingly delicious. The majority of the Nenets’ diet is fish. Once every one or two weeks, a group of the men from the brigade snowmobile out to the mouth of the Ob river. On one occasion I accompanied Sasha and the fishing group. We travelled for about two hours, just before the sun was setting. I was completely amazed at how they remembered where they had left their fishing nets in the middle of this river mouth considering it is an area that is incredibly vast and featureless. 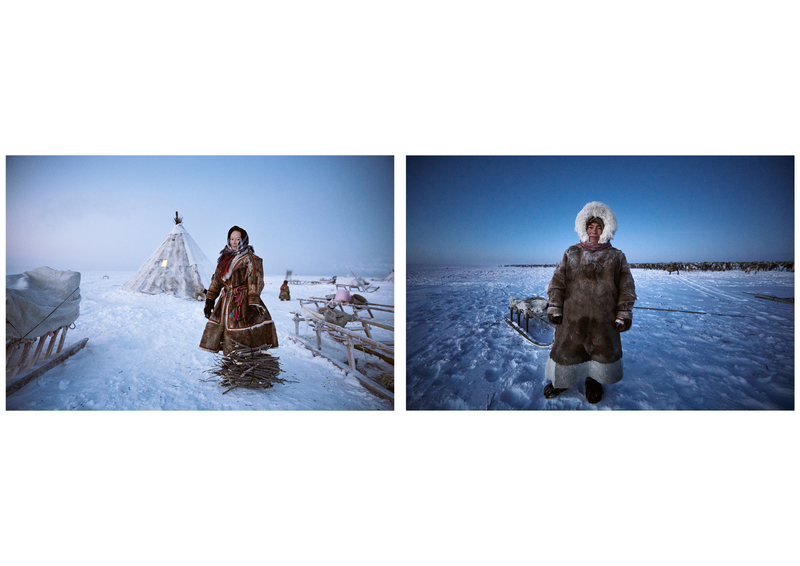 The general method of the Nenets’ fishing is to lay a net under the river’s frozen surface by ice picking and drilling two holes about 100 to 200 metres apart and stretching the net between and leaving it until they return when they retrieve the fish caught and relay the net. Sasha had set up about ten of these nets and it took working in complete darkness for about eight hours on the ice, at -60 degrees temperatures, to retrieve about 50 kg of fish that instantly freeze as soon as they are out of the water. Dinner with the family generally consisted of either more fish or stewed reindeer meat. About once every two weeks, a brigade or a few families would kill a reindeer from their herd. It is a sacred event, which unfortunately I didn’t get to witness but is done by strangling the reindeer with rope, done so that they do this to not spill any blood, which is collected completely and drunk immediately while it is still warm. The carcass is then divided with specific parts being eaten raw on the spot. 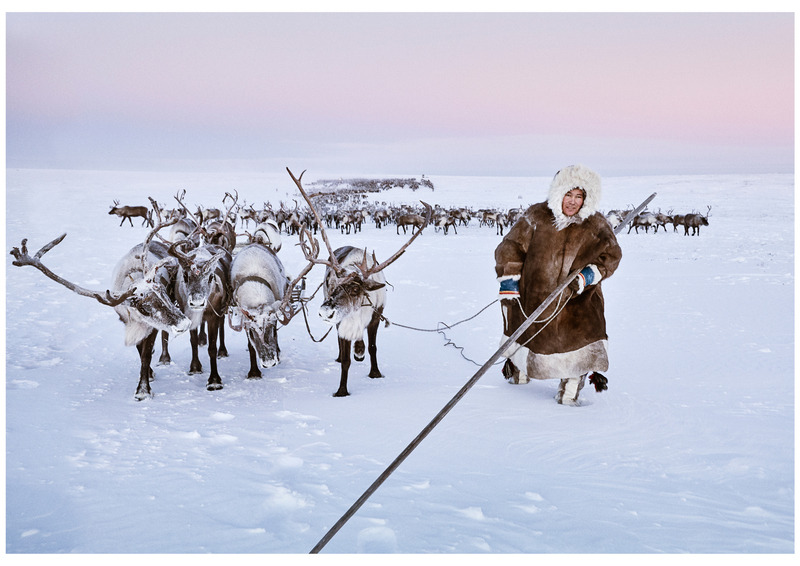 The reindeer are the most important element of the Nenets’ life, the whole reason they brave the extreme conditions and migrate as nomads constantly. During migration, the first task is the disassembly of the chum and loading the various parts onto numerous wooden sleighs forming a sleigh caravan. This process, which all families complete together, is done within about two hours. 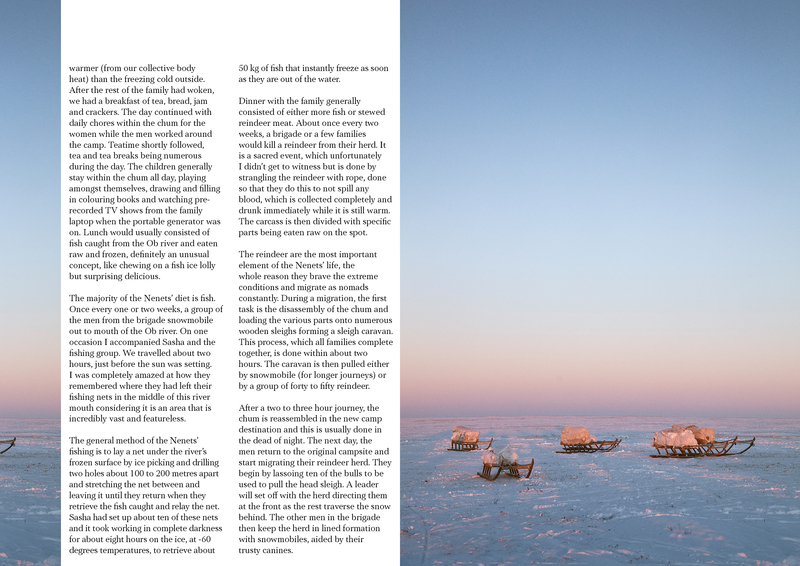 The caravan is then pulled either by snowmobile (for longer journeys) or by a group of forty to fifty reindeer. After a two to three hour journey, the chum is reassembled in the new camp destination and this is usually done in the dead of night. The next day, the men return to the original campsite and start migrating their reindeer herd. They begin by lassoing ten of the bulls to be used to pull the head sleigh. A leader will set off with the herd directing them at the front as the rest traverse the snow behind. The other men in the brigade then keep the herd in lined formation with snowmobiles, aided by their trusty canines. The journey is completed within two to three hours and the reindeer are left to graze about a kilometre from the brigade camp. It is a lengthy and effort-filled process, which is done about twice weekly during the winter but it is necessary for the reindeer to feed on new pastures under the frozen snow. The day with Sasha’s family generally ended with more chores. Sasha would be fixing fishing nets or sewing reindeer hide and furs to make their clothes. Essential to surviving the extreme conditions are the reindeer fur coats and boots. Though I was provided with western jackets, trousers and boots manufactured to brave the extreme conditions, Sasha insisted on me using their reindeer fur coat and boots which I found were much more effective, so much so that I found myself sweating most of the time I was outside. My fingers and face were the only body parts which actually did feel the extremes: my cheeks getting frost and wind burns (humorously called a “Yamal Kiss”) and my fingers got third-degree frostbite as I operated camera equipment with bare hands or thin gloves, the weather was definitely a challenge! The day always ended with the parents of both families in the chum playing and spending time with their children. Though I had been told that most Nenets’ idea of parenting was to leash their child to a post once they started walking (so they wouldn’t wander outside in the cold) I found the parenting skills shown to be completely opposite. Sasha and Pavel were extremely caring and involved fathers: changing nappies, cuddling, feeding and playing with their children: true happiness of both of their family units was evident. Just before bed, Vera would prepare the bedding for the family (clearing the edges of the chum floor where we would generally sit) and placing reindeer furs and extra coats down as mattresses. I would step out of the chum and spend a few moments watching the Northern Lights if they happened to appear that night. We all slept side by side, the sound of the fire and the freezing wind hitting the walls of the chum serving as a lullaby.